No, I replied. It just struck me as silly, and too sweet. 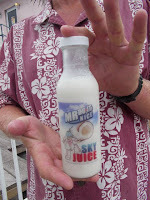 However, when “Lonely Planet's” Bahama guidebook mentioned ‘sky juice’ as an intriguing Nassau drink, curiosity prevailed. All the more so when I saw a bottle of chilled “Mr Do It Nice” for sale, at a time I was hot and thirsty. What is Bahamian sky juice? Urban Dictionary claims “there is no official recipe,” but at the very least it has coconut water and some sort of alcohol, generally gin. It tasted nutmeg-y. a bit like a thin eggnog, with a nasty alcoholic taste to it, quite different than a creamy, smooth but brandy-spiked eggnog. While I can’t judge all sky juice by my one encounter with “Mr Do It Nice,” my one encounter rather sucked. I was hot, and thirsty, as was Wayne. We split the 16-bottle, yet neither of us finished it. Using a screwdriver (or awl) and a hammer, poke through the eyes of the coconuts, and drain out the liquid through a strainer into a mixing bowl. There should be a total of about 2 cups. Set the shells aside. Add the evaporated milk, gin, sugar if using, cinnamon and nutmeg to the coconut water. Stir to dissolve the sugar. Refrigerate the mixture until cold, at least 2 hours, or cool mixture down with ice. To serve, carefully pour the mixture through a funnel into the reserved coconut shells. Insert straws. Mr. Do-It-Nice Sky Juice it would be a very dull world if we all liked the same thing. Nor do I expect all readers to agree with my opinion. In the case of Mr. Do-It-Nice Sky Juice, perhaps the reason it didn't fit with my tastebuds perhaps is exactly as you say -- I'm not Bahamian and perhaps I do have an overly Americanized palette. That said, there were a number of native Bahamian (like conch http://www.galleywenchtales.com/2013/06/reconsidering-conch-on-head.html) and other native foods I tried and loved (like and Mofongo http://www.galleywenchtales.com/2013/05/mofongo-food-love-puerto-rican-style.html in Puerto Rico). BTW I do happen to universally love curries, though confess, it is true that if in India, I might find one I didn't like. It is possible I would blog about it as my own experience. Part of my credibility is that I am honest about my own experience; good bad or in between. When I hear others experiences are different than mine, I will often blog about that; honestly embracing alternative views. As the producer of Mr. Do-It-Nice Sky Juice I expect you to be proud of your product and kudos to you for making it available bottled, thus more readily available, portable and even exportable. I am glad you have customers who love it. I just am not one of them. Most of my readers are also not Bahamian; they're mostly American. So, if the taste is so distinctly a Bahamian acquired taste, they too may find their tastebuds similarly impacted.